Or, to be a little more specific, asking them how they can tolerate being around all those guys — you know, the guys who do theory. I find it pretty frustrating because it often seems to come from scholars who say that they value thick description, taking their interlocutors seriously, avoiding reducing the people they study to simple or shallow formulas, etc. How ironic is it, then, that they seem unable to find the program online or the rooms in which the association meets each year, to come and listen for themselves, and to get to know those who attend and present at this meeting. For if they did make that effort — and yes, it is effort to do something other than generalize and caricature — they’d find sessions with brief summaries of pre-distributed major papers (available online not just to members), brief prepared replies from 3 or 4 respondents, and at least half the time of each session reserved for open conversation among all those in attendance (which equals about an hour for a pretty extensive Q&A). They’d notice a dramatic absence of senior scholars on the program (an intentional change NAASR made 5 years ago) and, instead, there’d be a wide variety of early career and some mid-career scholars, all working in an equally wide variety of positions in the field, from ABD and contingent to tenure-track. They’d also find a pretty wide variety of positions represented on the panels and in the audience, though a shared interest among most attending involves not just an interest to study religion as a human act but a focus on the tools and situations of our work in the academy. 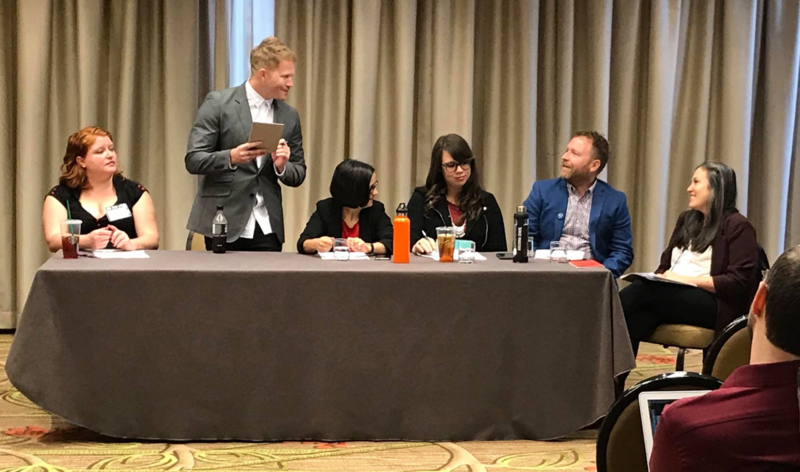 A visitor asking a few leading questions might reveal not only the number of people for whom this was their first time presenting or chairing at a national meeting, but also those who soon saw their presentation turn into a publication, since the NAASR annual programs have, since 2015, all resulted in edited books. 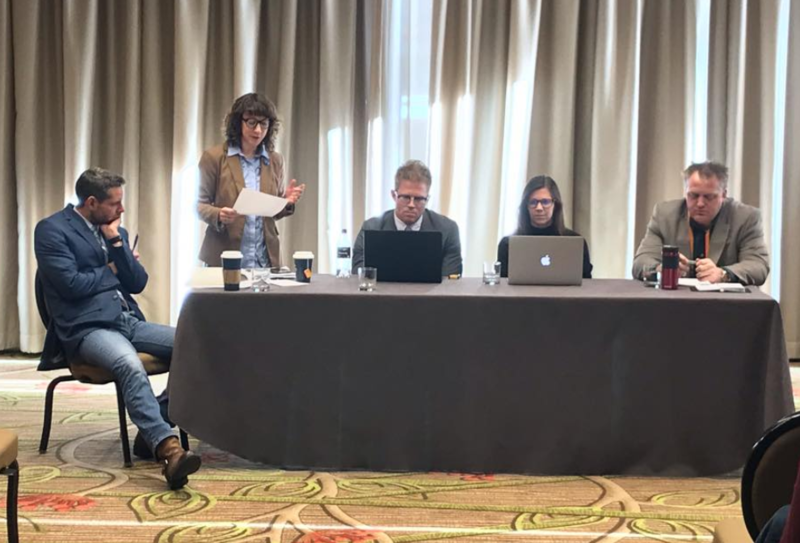 Aaron Hughes (NAASR’s Vice President at the time) edited one, followed by Brad Stoddard (now the President) editing another, and we’ll soon see Leslie Dorrough Smith’s volume appear, (from the 2017 meeting), and the volume edited by Rebekka King (the current VP), is now underway. (See some of the past programs here.) 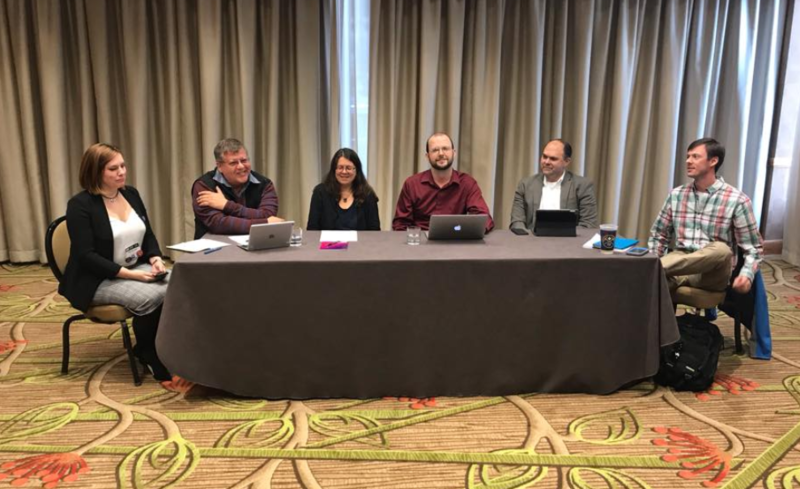 And, with that new announcement about the 2019 meeting, it’s also been announced that NAASR’s current Executive Secretary, Martie Smith Roberts, will be the editor for the next volume. Spending a little more time on the particulars of the group would also make evident to outsiders just how many publishing projects are linked to this admittedly small association, from Brill’s MTSR (a peer reviewed journal begun by graduate students and now a major international publication in its 31st year) to Merinda Simmons’s Equinox series, Brad Stoddard’s Equinox series, as well as Steven Engler’s book series with Routledge, not to mention Religion in 5 Minutes, a volume in which NAASR members formed the contributors and whose royalties help fund the organization. Add to this that the last project largely features chapters by scholars at very early stages of their careers and I think a skeptical visitor would start to see NAASR in a new light. What’s more, a little fieldwork would make plain that the 2019 program’s 4 grad workshops are in a long history of experienced faculty members volunteering their time to work one-on-one with early career scholars, to help orient them to some of the ins and outs of the field and the current job market, workshops involving pre-distributed CVs and cover letters with small group feedback during most of an afternoon at the annual meeting. These workshops — which have involved some well known scholars in the field, from Aaron Hughes and Julie Ingersoll to Merinda Simmons, Jason Blum, and Laura Levitt — are free, of course, and open to anyone wishing to enroll (i.e., not just NAASR members). So, when I hear people characterize NAASR as an old boys club, or portray theory as a guy’s thing, it’s not only a disservice to the wide variety of people who find it rewarding to work in this one area of the field but it also tells me all I need to know about how serious that person is about the need to engage in careful and fair description in the field. It’s a shame, really, because you’d be amazed all the good work its members do, whether at its conferences or, all year long, in their classrooms and publications. 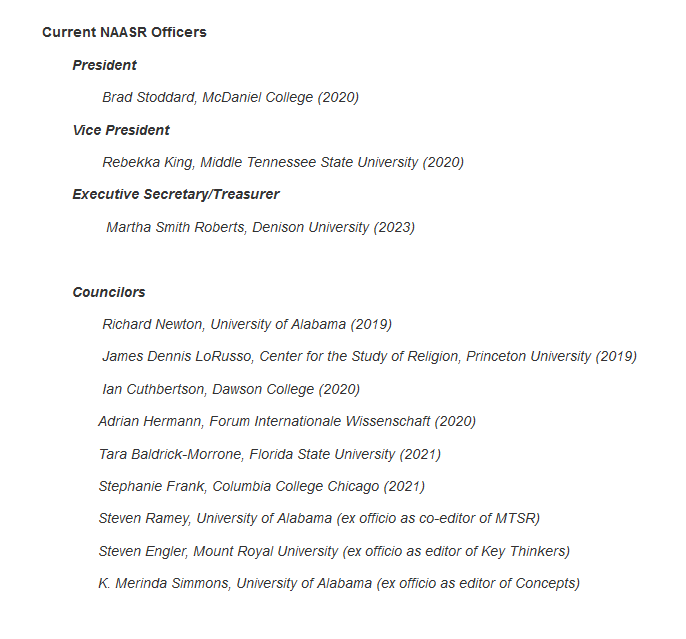 In fact, I’ve benefited so much from my own links to NAASR (whether early on in my career or to this very day) that I’m kind’a amazed more people don’t get involved and seek some of those same benefits for themselves. 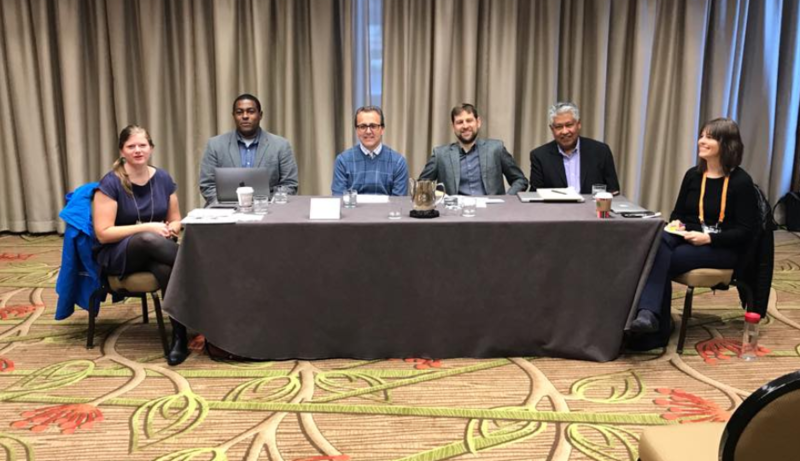 This entry was posted in Faculty Blog, Relevance of Humanities, Religion in Culture and tagged Conferences, Grad Students, NAASR, North American Association for the Study of Religion, theory, Workshops by Russell McCutcheon. Bookmark the permalink. Given that the org is stereotyped and sometimes attacked I think a voice defending it is rather appropriate. And all we have are topic specific discourses (we talk about things) but, ideally, as illustrative of wider issues we also see elsewhere. Trouble is how few scholars of religion can see their objects of analysis as but one eg of a larger issue or curiosity, instead taking what they study as self-evident and unique. NASSR is filled with members versed in specialized data but, I’d suggest, they try to study it as but an eg of something we also see elsewhere in human practice and organization—so a place where we can apply and test something that has other applications. So data is in the service of tools we hope also to use elsewhere.